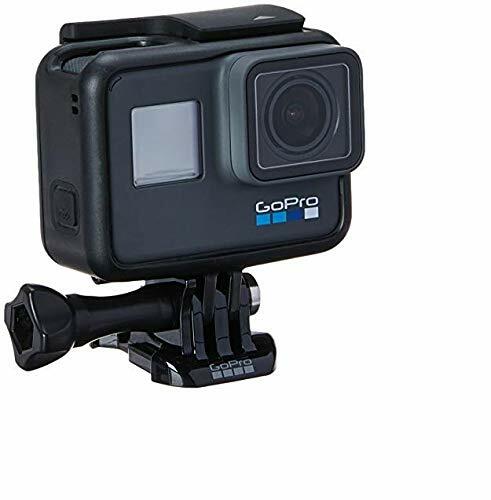 If you're looking for the absolute best action camera right now, with the best assortment of accessories, and the most user-friendly interface, GoPro Hero 6 has to be right up there in your top choices. The advancements offered by the GP1 chip are real, but they come with a cost. Voice control works well and mobile apps are first class. If there's one brand that's synonymous with action cameras, it's GoPro. The company has completely dominated the market, with arguably its most important year-to-date being 2017. That's because in late 2016 it entered the drones market with the GoPro Karma, which had big issues at launch, was recalled, and then the company had to recover from that seemingly catastrophic failure. Recover it did, however, to not only rectify the drone, but to get back to what it does best: building the best portable action cameras. And in the GoPro Hero 6, the company takes all that was good about the Hero 5 and turns it up to 11. From a design perspective, nothing has changed between the Hero 5 and Hero 6. That's no exaggeration: ignoring the external "6" markings, everything about the two appears the same. But that's no bad thing, though. The Hero 5 was the first Hero that didn't need extra waterproof housing, and the Hero 6 continues in the same vein. It's fully waterproof, up to 10 meters, and can be used for any above or under-water activity without massively distorting the image through its lens. It also has the same, grippy, rubbery material running all the way around the edges. Like most previous Hero cameras, the Hero 6 is a mostly rectangular design, a couple of inches wide and not much more than an inch tall. From the front, it's the camera lens that's most prominent, sitting in its protruding square home alongside the monochromatic secondary display. On the top, you'll find the usual shutter/record button, denoted by the red ring logo, while the Mode/Power button lives on the right edge (when looking from the back). Underneath is where you'll find the battery door, which can be opened by pressing down the small rectangular button and sliding the door away from its hinge. To remove the battery, you pull the tab. Similarly, the small door on the left edge protects the USB Type-C port and Mini-HDMI ports, and opens the same way. Other design choices worth mentioning, include the tiny, thin LED that flashes on the front and curves around the top left corner. There's another LED underneath the camera, right next to the small speaker, and a third to the left of the main touchscreen display on the back. The biggest advantage of the Hero 6 maintaining the Hero 5's design is that it will fit all the same mounts and accessories as the Hero 5. That's some reassurance if you've dropped mega bucks on a Karma Drone, Grip, or purchased dozens of stands and grips. Like all GoPro cameras, the small size is key part of its appeal. You can mount it anywhere, hold it, or throw it in your pocket, and it won't get in the way, regardless of where it is. It does sometimes mean making double sure your pinky doesn't stray over the lens when shooting handheld video and photos though. There are four main ways to control the new GoPro camera: using buttons; using the touchscreen; with voice control; or via the associated app. For hands-on use, there are the classic buttons for quickly taking photos, shooting video, or switching between modes. Switch the camera on by pressing the Mode/power button for a couple of seconds; this same button also cycles between shooting modes (video, photo, burst and time-lapse video). For more control, or to select other shooting modes, use the touchscreen on the back. In video mode, for example, you can tap the toolbar at the bottom of the display to choose the resolution, frame rate and field of view; extra settings are accessed by swiping from right to left where you can choose to activate ProTune (which lets you adjust the ISO range, white balance, shutter speed, sharpness and EV comp). As you can imagine, with it being a small 1.5-inch display, it can be a bit fiddly using the touchscreen, but GoPro has done a great job of making it as user friendly as possible within these confines. Most tasks are achieved using single-digit, long swipes across, up, or down the touch-sensitive surface. To get to the gallery, for example, it's a left-to-right swipe; to return to the main live preview, it's a top-to-bottom swipe. In the main preview mode, swiping down from the top reveals the general settings menu, which includes the date format, beep volume, which LEDs you want to illuminate, screen brightness, memory card formatting, and much more, including choosing your voice activation settings. Which brings us neatly to the most futuristic method of using the camera: via voice control. This feature was present in the Hero 5, and now it's been improved in the Hero 6. There are now a couple more commands, and the option of using voice to wake-up the camera. With this option switched on, the camera will keep an ear out for your voice commands for up to eight hours after you power it down. Just say "GoPro turn on" and it will. Sadly, there's no voice command for adjusting manual settings or anything more complex. Still, the camera handles the basics really well. Using the preset voice commands, the camera has always correctly responded to us with the appropriate action. Last up is perhaps the most cumbersome method of control: using the GoPro app by connecting your smart device via Bluetooth. This presents a live feed from the camera, along with controls to change photo or video shooting settings, but there's some lag which can be irksome. That said, for arm's length use - such as when using the camera on an extension pole - it's an invaluable control method. Most think of the GoPro as being predominantly a video camera, but with the Hero 6 the stills photography has seen a huge improvement in overall quality thanks to the new custom GP1 processor. This processor means all photos now have a much better dynamic range, and, for the first time, HDR capabilities (that is high dynamic range, used to auto-balance peak highlights and shadows). That means photos in general pop with a lot more colour and contrast, but without being over saturated, too bright or too dark in any one area. Details seem that little bit clearer than from the Hero 5, and images are more lively overall. One of the biggest differences is noticeable when shooting using the Night Mode. Now, by default, it can take exposures up to 10 seconds long, ensuring that even in the dead of night with minimal light, you can still take a considered night show photo (so long as the camera is dead still!). There's also a new digital 2x zoom, which works well, providing you can get past using the fiddly onscreen slider. As with most small-sensor cameras shooting in auto mode, however, the Hero 6 isn't great in low-light conditions. Shooting in the usual Photo Mode does produce slightly noisy results with less impressive colours, because the camera is trying to ensure balance of shutter speed and ISO sensitivity for the right handheld exposure. However, there is a low light mode and the ability to fine tune settings using the ProTune mode. What's more, you can shoot raw files too. Moving to the most important element: video. As per photos, the detail and colour from the Hero 6 is bit punchier than from the Hero 5 of last year, but there are a few important key additions here, again made possible with the custom GP1 processor. The first is the addition of 4K at 60 frames per second. For fast action footage, this ensures that the motion on screen is ultra smooth - and ideal for slow-motion at half time, if you want. The only downside of 4K60, due to physical constraints (not wanting the camera to overheat), is that you don't get to use the awesome new digital stabilisation. On the plus side, this 4K60 content is saved using the HEVC video codec, ensuring you lose no detail, while keeping the bitrate to a minimum, meaning your camera won't die during capture. For all other video modes there's 3-axis digital stabilisation. To enable this, the image is cropped ever so slightly (so the shot is less wide-angle) so the camera can utilise the built-in motion sensors. As a result the Hero 6's video footage is much smoother and shake-free compared to the Hero 5. We tested it on a mountain bike ride, and the end footage was as smooth as could be, successfully ignoring the vibrations and bumpiness of the trek. In addition to regular video recording, there's a 4K video time-lapse which gives really great results and is customisable. We enjoyed the new slow-motion much more though, which captures at 1080p resolution at an impressive 240 frames per second. As with a lot of high-framerate (HFR) capturing, you need a lot of light to make it look good, but in daylight, the end results are awesome. Another key improvement for the Hero 6 is the addition of 5GHz Wi-Fi, again made possible by the GP1 processor. With QuikStories - a feature we've explored in the past - that means the camera offloads content to your phone way faster than it did before. Of course, if you're shooting in 4K this still takes some time, but it's quicker via 5GHz. We did encounter some issues, though. One of our longer 340fps video clips just wouldn't play on our iPhone, despite all the other footage working perfectly. That meant we had to load it into Premiere Pro on a desktop computer to view it. This was just one of 60+ files captured by the camera, so seems like an isolated bug - but something others may experience. When we first used QuikStories we thought the auto-selection software wasn't always able to choose the right moments from a video collection, while cutting away at the wrong time more than it would get right. In the Hero 6 this seems fixed, again thanks to the GP1 processor, as the camera is able to analyse the motion of the camera during capture, as well as facial and audio recognition to understand when action is happening. This means QuikStories are improved somewhat, avoiding cutaways at the wrong moments. It may look just like the Hero 5, but the advancements offered by the new GP1 processor chip are real, from 4K60 capture, to 5GHz Wi-Fi transfer, improved stills and impressive multi-axis image stabilisation. This does, however, come at a cost: at £499, the Hero 6 is the most expensive GoPro camera to date. But if you want the absolute best GoPro out there, then the Hero 6 is worth it. It's noticeably better than the Hero 5 in almost every measurable way. It looks the same as the Hero 6, and costs £100 less. If you can live without the ultra slow motion video, HDR still photos and 60fps 4K video, the Hero 5 will get you by just fine.